There is a debate about how actually invented the parachute. There’s written designs by da Vinci. Jean Pierre Blanchard may have made the first to make a successful parachute jump. The parachute was invented by Leonardo da Vinci probably the first to make the design of the parachute and so he is probably credited for the invention for the parachute. It was reinvented in 1783 by a French chemist, Louis Lenormand who also was the first to make a parachute jump. A French aeronaut, Jean Pierre Blanchard, claimed the invention of the parachute in 1785, and the first successful parachute descent from a great height was made in 1797 by the French aeronaut Jacques Garnerin, who dropped 3,000 ft (920 m) from a balloon. Parachutes began as an escape system for persons aboard balloons or aircraft unable to land safely. Modern military jet aircraft are provided with ejection seats that shoot occupants free of their craft and automatically release a parachute when they are at a safe altitude. In addition, since World War II parachutes have been used by the military for airborne operations and emergency resupply. In recent years, parachute jumping for sport, known as skydiving, has become popular. Parachutes are also used as braking devices for rockets, space vehicles, airplanes, dragsters and other high-speed surface vehicles. 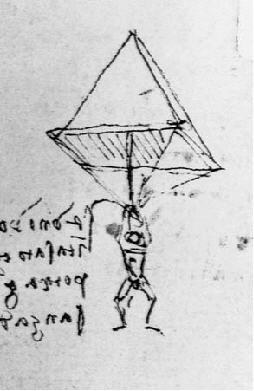 Other early inventors designed parachutes, including Croatian Faust Vrancic who constructed a device based on Da Vinci’s drawing. Faust Vrancic jumped from a Venice tower in 1617 wearing a rigid-framed parachute. Faust Vrancic published Machinae Novae, in which he describes in text and picture fifty-six advanced technical constructions, including Vrancic’s parachute called the Homo Volans.